This might save you an occasional click or two. Update Sep27th: Added Outlook 2013 to list of supported clients. During Ignite 2018, details are announced to the public on Exchange Server 2019, Exchange Online, as well as Office 365 and related technologies. In this article I’ll try to summarize all the details in a readable format for your reference. The list is probably inconclusive; if you think anything is missing, let me know to I can update the article. Exchange supports in-place upgrading of underlying operating system per Windows Server 2019. Exchange Server 2016 and Exchange Server 2013. Outlook 2013-Outlook 2019, Outlook 2016/Max and Outlook for Mac for Office 365. Recommended minimum memory for Mailbox server 128GB, and 64GB for Edge Transport. Maximum memory is 256GB (Exchange 2016: 192GB). The reason for 128GB recommendation is that the .NET scaling benefits (see below) only work from around 100GB and up. Page file 25% of installed memory (Exchange 2016: Maximized at 32GB). Uses Server GC instead of Workstation GC for some IIS application pools. Better .NET memory management and improves CPU/memory scaling. Evaluated at server level, so external connections need to hit Exchange 2019. 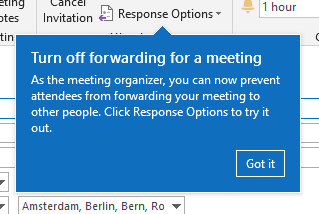 Setting Out of Office in OWA allows for blocking calendar for that period, as well as decline current meetings and future meeting invites during that period. The Exchange Server 2019 documentation went live here. Some additional details were included in this list. On another note: Greg Taylor gave an interview to Phoummala Schmitt (aka @ExchangeGodess) for Channel 9 on Exchange 2019. That replay can be watched here. Also, Scott Schnoll and JeffMealiffe as well as Greg Taylor and Ross Smith were interviewed by TheCube; those recordings can be watched here and here respectively. 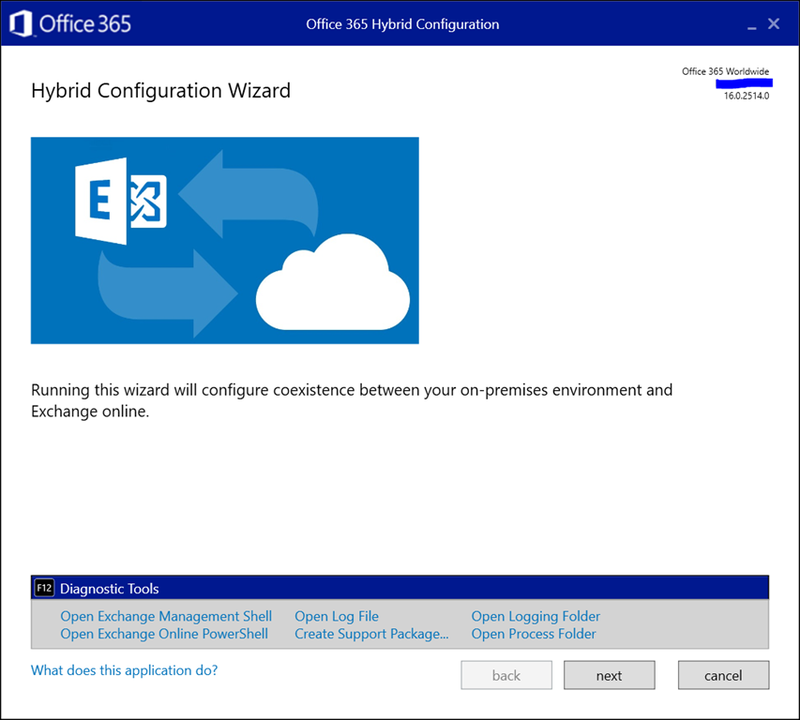 Hybrid Proxy Service in the service will proxy requests between Exchange Online and Exchange on-premises. The Exchange team published a quick blog on OCT and Hybrid Agent here. Among all the announcements of upcoming products and changes in the service, more details will also be revealed of Exchange Server 2019 and related products at Ignite next week. To those who are not able to attend, like yours truly: do not despair as Microsoft will be live streaming all keynote, breakout and community theater sessions. The place to view those streams is through the Tech Community portal, and likely the session info pages will be used to embed the streams or provide links as they become available. Note that the table above was constructed using the Get-EventSession script. That script has been updated recently so it can also download on-demand sessions when downloadable video contents aren’t available (e.g. Inspire). I’ll be closely monitoring next week to check if the script can cope with the way Ignite contents will be published. In a surprise – but welcomed – move, Microsoft announced yesterday that the office support lifecycle for Office 365 ProPlus on Windows 8.1 and Windows Server 2016 are extended to January 2023 (EOL of Windows 8.1) and October 2025 respectively. In addition, Office 2016 connectivity support for Office 365 services will be extended to October 2023 (was 2020). Other announced changes in product support lifecycles were extending Windows 10 Enterprise & Education support from 18 to 30 months. Also, for Windows 7 Professional & Enterprise, paid security updates (Extended Security Updates) will be offered, and those Windows 7 ESU devices will be supported through January 2023 – parallel to Windows 8.1 – with Office 365 ProPlus. The intention of these changes is to provide customers more flexibility in adopting modern desktops on the client end (i.e. Windows 10) and upgrade their Office suite, preferably to the susbscription-based ProPlus. The release cadence of the cloud has significant impact on organizations, which were told in February to keep in line with product releases as a lot of product support lifecycles were going to end in 2020. Extending those dates not only gives them more flexibility to plan and upgrade, but also might prevent organizations to do only to the minimum, which is likely the reason many organizations are still on Windows 7 and why it took many organizations a long time to get rid of Windows XP. A quick heads-up as during my vacation Microsoft released security updates for supported releases of Exchange Server 2016 and 2013 as well as Exchange Server 2010. Be advised that Exchange 2010 SP3 Rollup 23, like recent Cumulative Updates of Exchange 2016 and 2013, requires Visual C++ Redistributable Packages for Visual Studio 2013 (download). KB4340731 supersedes the previous security update KB4092041 for Exchange 2016 and Exchange 2013. Be advised that for Exchange 2013 and 2016, Security Updates are Cumulative Update level specific. While the downloaded security updates may carry the same name, the files are different and you cannot apply the downloaded security update file for Exchange 2016 CU8 to Exchange 2016 CU9. I suggest adding some form of identification of the Cumulative Update to the file name when you archive it, e.g. Exchange2016-KB4340731-x64-en-CU10.msp. As with any patch or update, I’d recommend to thoroughly test this in a test and acceptance environment first, prior to implementing it in production. Last Update July 19th: Corrected Update information. About a week ago, Microsoft released the July Updates for Windows systems. Unfortunately, something must have gone wrong in quality control, because people were reporting all sorts of issues, mostly related to IIS and Exchange servers. The issue is created at the operating system level, probably due to changes in networking as mentioned in the July update notes. Therefor, symptoms can be experienced on systems running Exchange Server 2016 or even back to Exchange Server 2007. The World Wide Web Publishing Service – W3SVC – won’t come up, remains in a “stopping” state, but cannot fully stop or it cannot be restarted. Exchange Transport and SMTP services becomes unresponsive or stops, causing mail flow issues (Source). The issues were serious enough to have the Exchange PG publish a notice. Meanwhile, Microsoft has released a superseding update for Windows Server 2016, and updates for older operating systems. However, looking at the information provided with updates for older operating systems, there are fixes for the original security updates, and (previews of) Monthly Rollups for the July updates. Replacements and updates may manifest themselves in Windows Update only after installing the original – faulty – update, meaning you might have to go through more than one Windows Update cycle (and possibly reboot) for the updates to become visible and installable. This applies to the Monthly Rollups as well. The table below contains information on the original rollups and updates, the update you need to apply, and the type of update. Finally, apart from adopting a less aggressive updating strategy, this again shows unfortunately that having a separate production environment next to your test environment is no frivolous luxury. Updated July 3rd: Includes newly registered awardees and awardees who changed category. Added overview of Office Servers and Services numbers over last couple of years. With the latest annual award cycle, one might be curious which impact it had on the MVP population. I performed a similar exercise last year to compare the impact of the start of the new award cycle. This year, all the MVP’s previously on the January and October cycles were also included in the reviews, making this year the first one where MVP leads and others had to perform the dauntless task of reviewing community contributions of over 3,500 people. For comparison, I had a look at the public MVP statistics of July 1st against those of June 26th, to exclude significant noise from the monthly awardees. To start, let us first have a look at the total population of MVP’s. From the numbers, it is clear some type of correction took place, as the total number of MVP’s went down from 3,815 last month to 3,025 now (-21%). As big changes might be a result of change of focus, the following table contains the changes per award category from June 2018 to July 2018. Note that the total number of MVP’s doesn’t equal the total number of awardees, as people can be awarded in more than one category; there are 50 MVP’s with multiple award categories. Except for the AI MVP’s, all the numbers are down. Way down. Word is quite a number of long-standing MVP’s have not been re-awarded this cycle. One could only guess for the motivation (only Microsoft knows), but it could be due to the ongoing shift from on-premises technology to cloud-based technology. 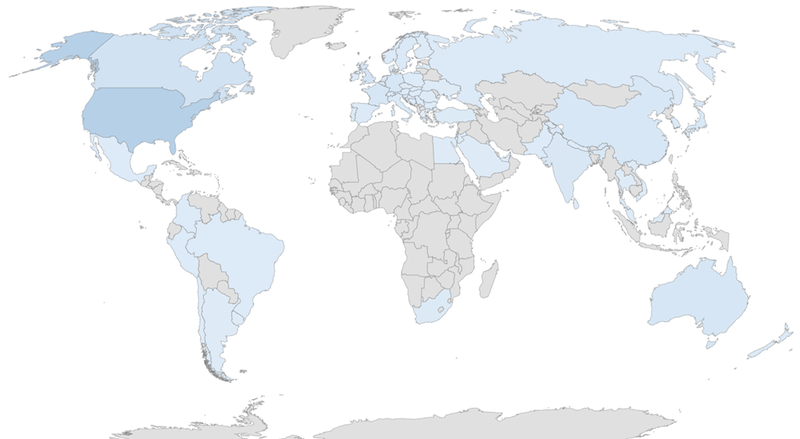 When zooming in on the Office Servers and Services MVP’s category, the awards per country is shown in the following heath map and table. Be advised that MVP’s that are anonymous or have profiles without location (~23 for Office Servers and Services), are not taken into account since their location is unknown. As shown, some countries have lost their Office Servers and Service MVP’s completely. Looking at the total number of Office Servers and Services MVP’s over the year, the number went a little up again due to monthly awardees, but with the July cycle, the number of Office Servers and Services MVP’s went from 490 to 383 (-22%). The number of Office Servers and Services and total number of MVP’s over the last years (since award restructuring). Unfortunately, I have no data on the other categories from before june 2017. If you have questions or comments, please discuss in the comments. Supporting others, e.g. forum or TechCommunity contributions. This is my 5th consecutive year as an MVP. I used to be an “October MVP”, which meant my award was up in October every year. After the award cycle changed to a yearly one for everyone, this year was the first time all MVP’s who fell under the old quarterly cycles, were being up for renewal. It also meant, contributions of a longer period of time were being evaluated. So lots of kudos to the MVP leads and other folks that had to go through the monstrous task of reviewing thousands of contributions for this cycle. Many thanks to the community, readers, followers, fellow MVP’s and friends, peers, product groups and other Microsoft employees for their encouragement, inspiration and support over all those years. My MVP profile can be found here. The Exchange Team released the June updates for Exchange Server 2013 and 2016, and an additional Rollup 22 for Exchange Server 2010 Service Pack 3. As announced earlier, Exchange 2013 CU21 and Exchange 2016 CU10 require .NET Framework 4.7.1. All three updates require the VC++ 2013 runtime library, because it is needed by a 3rd component in WebReady Document Viewing in Exchange 2010/2013 and Data Loss Prevention in Exchange 2013/2016. Exchange 2010 SP3 RU22 will force installation of this VC++ runtime. Updates include a critical security patch for Oracle Outside In libraries. More about the issue in MSRC advisory ADV180010. Exchange 2013 CU21 and Exchange 2016 CU10 introduce support for directly creating and enabling remote shared mailboxes, e.g. You need to run setup /PrepareAD to see these changes. More information in KB4133605. This is the last planned Cumulative Update for Exchange 2013 as it enters Extended Support. Exchange 2010 SP3 RU22 adds support for Windows Server 2016 Domain Controllers. Exchange 2016 CU8 and Exchange 2013 CU18 do not contain schema changes compared to their previous Cumulative Update. However, they introduce RBAC changes in your environment. Use setup /PrepareAD to apply RBAC changes, before deploying or updating Exchange servers. When upgrading from an n-2 or earlier version of Exchange, or an early version of the .NET Framework, consult Upgrade Paths for CU’s & .NET. When upgrading your Exchange 2013 or 2016 installation, don’t forget to put the server in maintenance mode when required. Regardless, setup will put the server in server-wide offline mode post-analysis, before making actual changes. When using Exchange hybrid deployments or Exchange Online Archiving (EOA), you are required to stay at most one version behind (n-1). The order in which you upgrade servers with Cumulative Updates is irrelevant. As for any update, I recommend to thoroughly test updates in a test environment prior to implementing them in production. When you lack such facilities, hold out a few days and monitor the comments on the original publication or forums for any issues.